101 Accessible Vacations contains destination information on over 101 cities, lodging options, national parks, tourist attractions and recreational activities around the country. The book is organized so readers can search for a holiday based on their specific interests or travel styles. 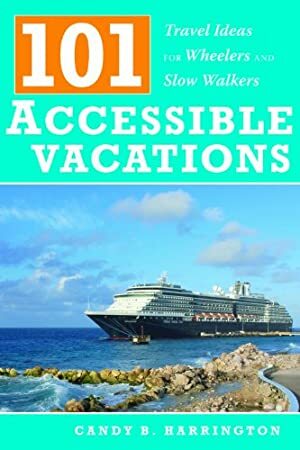 Unlike other guidebooks that are organized geographically, 101 Accessible Vacations includes sections ranging from Road Trips and The Great Outdoors to Historic Haunts and Cruisin. And last but not least, there is Candy's Picks, which includes a collection of some of the author's favorite trips, destinations and activities. Candy describes the access of all attractions, lodging options and tourist sights, rather than just stating that something is or isn't accessible. After all, accessibility is in the eye of the beholder; and what may be accessible to one person can be filled with obstacles to someone else. Says Harrington, There's a world of travel choices out there for wheelers and slow walkers. And this book contains many of those choices; along with updated resources, information and access details to make them a reality. Track It. This book has been $3.82 within the past year. We started tracking this book on August 14, 2012. The price of this book has changed 30 times in the past 2,443 days. The current price of this book is $4.49 last checked 21 hours ago. This lowest price this book has been offered at in the past year is $3.82. The lowest price to date was $3.82 last reached on March 31, 2019. This book has been $3.82 one time since we started tracking it. The highest price to date was $20.99 last reached on January 3, 2019. This book has been $20.99 one time since we started tracking it. We last verified the price of this book about 21 hours ago. At that time, the price was $4.49. This price is subject to change. The price displayed on the Amazon.com website at the time of purchase is the price you will pay for this book. Please confirm the price before making any purchases.